Annihilation: The Complete Collection Vol. 1: A classic crossover returns – AiPT! This week Annihilation: The Complete Collection Vol. 1 will be released, and I hope that if you have never had the pleasure of reading any of this story, you will run right out and pick it up. 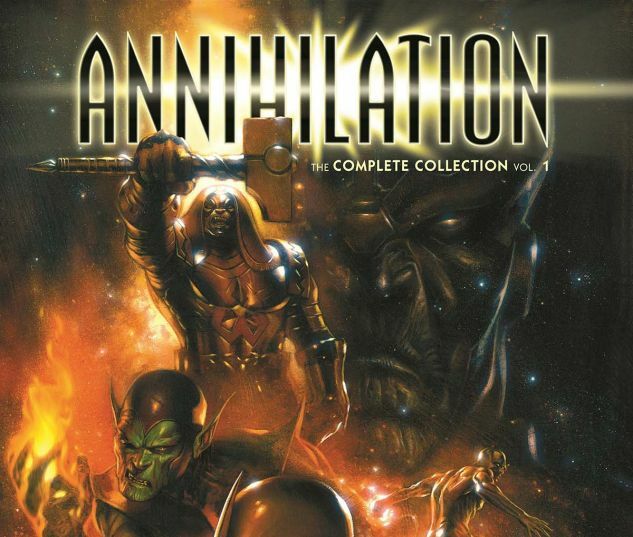 Annihilation first hit comic book shelves way back in 2006 and became an instant hit. There aren’t many crossovers that you can compare to this great space tale. This week Annihilation: The Complete Collection Vol. 1 will be released, and I hope that if you have never had the pleasure of reading any of this story, you will run right out and pick it up. What’s all in the collection, Dave? Annihilation: The Complete Collection Vol. 1 is a pretty thick book and collects an assortment of stories. Included in the collection are Drax the Destroyer, Annihilation: Prologue, Annihilation: Nova, Annihilation: Silver Surfer, and Annihilation: Super-Skrull. Wow! How much more annihilation can you jam into one book? It is definitely worth the price of admission. Allow me to give you a quick rundown of each. Drax the Destroyer is written by Keith Griffen, art by Mitch Breitweiser, and Brian Reber does the colors. Drax is on a prison transport ship that crashes in Alaska. He tangles with the Blood Brothers, Lunatik, and Paibok. He then crosses paths with a teenage girl named Cammi and the pair ends up being arrested by a second prison ship. Don’t worry, you will see Drax and Cammi later in the book. Annihilation: Prologue is written by Keith Griffen, with art by Scott Kolins, Ariel Olivetti and colors by June Chung. A massive armada of warships, under the control of the evil Annihilus, called The Annihilation Wave enters this universe through “The Crunch”, an area of space where the Negative Zone and this Universe meet. The Kyln and many neighboring star systems are quickly conquered. The Nova Corps call in all Nova Centurions for a top-level briefing on Xandar, the Nova Corps’ home world. During the briefing The Annihilation Wave invades and destroys the planet including all Nova Corp members, except for Richard Rider, a lone human Nova Corps member. Rider has a hard time facing the reality that all his brethren are dead. Annihilation: Nova is written by Dan Abnett and Andy Lanning, with art by Kev Walker, and colors by Brian Reber. After the fall of Xandar, Richard Rider, is the last surviving member of the Nova Corps. Rider allows Worldmind, the artificial intelligence compiled of all the knowledge and experiences of the entire Xandarian race, and the cosmic power utilized by all Nova Corps members, to download itself in its entirety into his mind and body in order to prevent it from being lost to the universe. Rider becomes Nova Prime. Worldmind fashions a new uniform designed to help regulate the immense power of the Nova Force, as well as augmenting Nova Prime’s emotional and mental capacities with its own to keep Rider from going insane. Nova Prime crosses paths with Drax and Cammi. The trio leave what remains of Xandar and speed to the next star system, where they find Quasar, possessor of the Quantum Bands assisting in the exodus of one of its star system planets. The Annihilation Wave arrives and Nova Prime and Quasar attack in order to give the exodus enough time to succeed. Annihilation: Silver Surfer is written by Keith Giffen, with art by Renato Arlem, and colors by June Chung. Annihilus dispatches the Seekers to capture beings instilled with the Power Cosmic. Meanwhile, Silver Surfer joins forces with other former heralds of Galactus, Firelord and Air-Walker. To protect Galactus from the Seekers, the Surfer replaces Stardust as his herald. Galactus reveals that the Annihilation Wave’s destruction of the Kyln may have freed two Proemial Gods, Aegis and Tenebrous, who he imprisoned. But Thanos also wants to form an alliance with Aegis and Tenebrous! Annihilation: Super-Skrull is written by Javier Grillo-Marxuach, with art by Greg Titus, and colors by Chris Sotomayor. Once the Annihilation Wave reaches the Skrull empire, it begins using a weapon known as the Harvester of Sorrows, a huge ship which renders entire planets into fuel for the armada. Learning that the planet his son lives on is in its path, Kl’rt the Super-Skrull and a young Skrull engineer, R’Kin, travel to the Negative Zone to find a way to stop the Harvester. Wow, Dave! You weren’t lying this book is stacked! Yes, and they are all entertaining stories told by all the writers. Giffen carries the bulk of the writing and does an incredible job of intertwining the stories and creating them all to fit the main narrative. Abnett and Landing’s Nova story is my favorite. I am a huge fan of Abnett and for him to make me care about a Nova officer says something about the way he tells a story. Grillo-Marxuauch’s Super-Skrull is a fitting way to end the book. I was never really into the Skrulls but Grillo-Marxuauch pulls you into his tale with force. The stable of artists for each of the titles are an impressive group as well. You have the talents of Mitch Breitweiser, Scott Kolins, Ariel Olivetti, Kev Walker, Renato Arlem, Brian Reber, and June Chung. Combined, they all illustrated a visual masterpiece. From Silver Surfer cruising through the cosmos to the strife of Richard Rider, you see all the emotion and exciting action as you flip the pages. The artwork is gorgeous and syncs with the story perfectly. Annihilation has aged well. If you have never read the story, this is an excellent place to start. The stories are incredible, the art is breathtaking, and it is just a thrill to read. A lot of these characters are more familiar now that they have been in Marvel movies, so if you dig the movies, this is an outstanding book to read and see how the characters were portrayed over 10 years ago. Annihilation: The Complete Collection Vol. 1 is out this week; it is well worth the money. Run out and pick it up!